US Airways is not one of my favourite airlines. In fact, they rate in my bottom ten airlines based on my previous experiences of their service. I have given them an overall 2.9 out of 5 after a decade of flying them. My experience is that every time I fly them they have declined. I try to fly airlines I actually like flying. However, when I find a flight, that fits best schedule and price wise, then I will fly them, even with a carrier I don't like. It also gives me a chance to remember why I don't like that airline! My client booked me on USAir which gave me a good chance to test them out! Upon receiving my booking confirmation, I logged onto to US Airways.com to find my seats. The US airways site is clear and simple and works very well except for at times what appeared to be pages that would not load or took a long time to load. I chose an exit row seat for an extra $14 for my connecting flight from Charlotte but the seating chart for Houston to Charlotte would not load. I kept getting a message saying “your session is about to time out would you like more time?” Boy I do love that feature. I hate being logged out of airline websites. Thanks USAir. It took 24 hours of trying until the seating chart would load. When it did, the entire flight was full with only three empty seats: 7A and 10A and 23E. I had been allocated 23E. The US airways site offered to sell 7A and 10A to me for an extra $20. I was puzzled. Why would those seats be better than other? To find out, I looked at seatguru.com and found out that Seat 10A does not recline and is misaligned with the window if you want too look out, you have to lean. You will note Seat guru have give it a red flag!As I love looking out the window that seat was no good. 7A (in yellow) has no window at all!' No wonder they were empty. Who would pay $20 extra for that? Check in online was easy. Well done US Airways. As I travelled out to Houston International airport to catch my first flight to Charlotte due to leave at 540pm, US Airways emailed me to advise that my plane was delayed by two hours and 2 minutes. I knew immediately that I would miss my connection from Charlotte to Richmond. I logged onto the internet with my phone, to see what alternative flights there were. There were none. 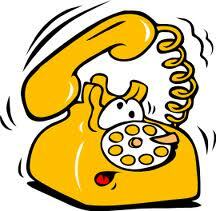 Armed with this information, I rang US airways. First up, the automated voice system. Yuck. I don't care what they are called: Cindy, Anne, Jennie, or Gene someone needs to tell the airlines in the US to program their automatic answering systems for Australian accents, I have a very clear speaking voice but my vowel sounds tend to foul up the American systems. Machine: I am sorry I don't understand. Please repeat. I then pushed “0” repeatedly. Sometimes that works to get me to an operator and it did today! “Welcome to US airways my name is Barry, how can I help you? Barry: Ah sir, I regret to inform you that your first flight is severely delayed, You wont make your connection. [I think I said that] Let me see what I can do. (minutes later) Sir there are no other flights tonight. Barry: Sir there are no flights tonight. Do you have any flexibility? Me: No not a lot I have an important meeting at 830am tomorrow morning in Richmond. Barry: I don't have any fights that will get you to Richmond by 830am from Houston but if you are prepared to drive to San Antonio you could take one at 747pm. Me: Do you realise how far San Antonio is from Houston? At Houston airport. 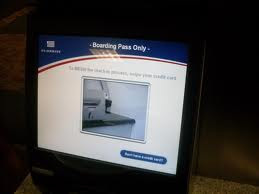 I used the USAirways check in machine to print my boarding pass. There was long line of passengers waiting to talk to a human. As I started the check in process, another passenger called out to me: "are you in the flight to Charlotte?" He said "its delayed". I thanked him and said “Yes I know”. He said: "the machine wont work. You will need to join the line. I said: "let me have a try"
Clearly, Barry the human from Reservations had worked his magic an changed my flight as my flight immediately loaded for check in. Security had a very short line so I was through in minutes. I had brought snacks with me. Which was just as well. Food options in terminal C were very limited. There was a very busy McDonalds a Starbuck closing, a yoghurt shop , a pizza chain and a Chinese take out. Not many light or healthy options of for the Australian options like healthy choice or sumo salad or even a subway! My plane landed at gate A19 and an announcement was made to gather board: "Ladies and gentleman we are ready to board flight to Charlotte. Because of the delay we are boarding all zones, all rows." There was an immediate stampede. I don't understand that logic, why dispense with the normal boarding process when a plane has been delayed? If a passenger has paid extra for :”First Class' or an extra seat (14 to 20) would probably feel a little miffed to be left to last? Boarding was quick. I think people wanted to go . Business class was full, the middle was two thirds full and the rear was almost empty. Take off we very fast. He really gunned us out of there. As we climbed off the runway we immediately started shuddering through heavy wind gusts, soon we were executing a 90 degree turn as we bounced up and own. We climbed gently from there steadily bouncing. There were no announcement from the crew or the captain. I like the way Qantas regularly make announcements prior to this happening. For the nervous passenger, I think they like to known then bouncing is expected and normal; (I was far from nervous on this flight). 20 minutes from takeoff, the cabin crew advised us that the captain had requested crew remain in their seats because of navigating round weather. It wasn't long before the seat belt sign went off and we had smooth flight for the rest of the shift. USAir service was a free drink in a plastic cup. Coke products. No snacks. This was in addition to a plane with no entertainment or wifi. This was followed by the FA making announcement that us air would like to have us all 30, 000 miles. I commented to the guy two seats away from me "Talk abut hard sell!" and he told me that they get $75 for each card application! She must have been saving for something! The rest of the flight was uneventful. I found all staff to be very friendly in contrast to the past. This is despite industrial action currently taking lace between USAir pilots and the airline. Flight 2: 4 out of 5. A lot can happen between now and check in so fingers crossed! 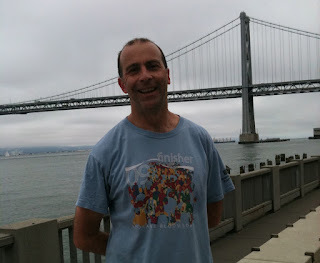 I started the day with a run along the waterfront near the Embaracdero with the city on one side and the Bay on the other: -outstanding! I ran 5miles (8 kilometres). This got me ready for breakfast at the Ferry Plaza Farmers market. 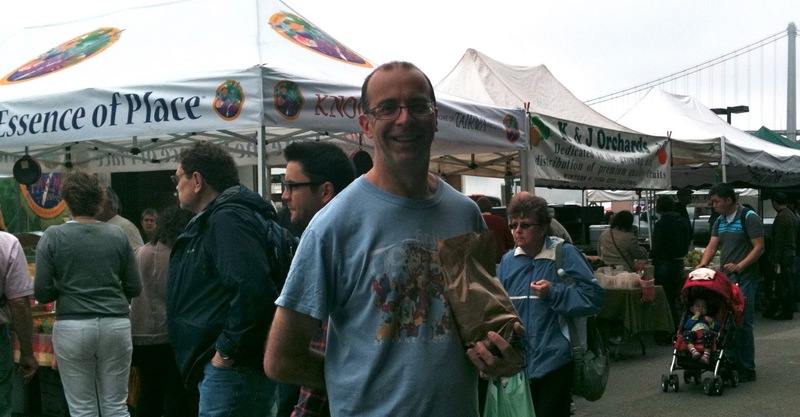 Held three times a week, it has an amazing range of local, fresh and often organic fruit and vegetables. I bought the most delicious peach I have had for years, As the juice rolled down my fingers, I marvelled at the difference to the supermarket ones I buy from time to time. No comparison. I also bought raspberries, strawberries and blackberries (the green bag in the photo is full of berries). Listening to the music being played by the musicians around the market and watching the buzz i wandered inside the wonderfully restored ferry building. I was tempted to buy fresh buttermilk biscuits (thinks scones for Australians, New Zealanders and British people) or organic steamed pork buns but resisted. My destination was Recchiuti Confections, the best chocolate store in San Francisco according to me and yelp!). I love their Burnt Caramel Almonds. I learnt that they ship all across the United States but was disappointed to learn that their ginger chocolates no longer contain Australian ginger. I popped across the road to Noah's Bagels on Market Street weaving my way through the outdoor craft market for a bagel with cream cheese! Yeah, I am a geek. The streetcar (tram) outside the Museum is for the F Streetcar line to Fishermans' wharf. I always get on there because you are more likely to get a stop as the next stop is always very busy. 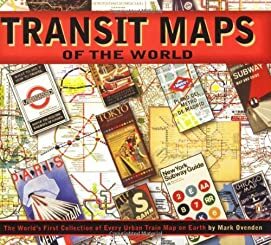 This line uses historical trams form all over the world. I have even ridden a Melbourne Tram in San Francisco! Today's tram was originally from Philadelphia. Confession: I hate Fisherman's wharf and Pier 39 don't understand why every tourist feels they have to go there! I like the sea lions that have been living there for the last 20 years or so but that's about it. The other feature I love is Ghiradelli Chocolate Factory. A tradition of mine is that on every trip I have a Cable Car Sundae: Rocky road, chocolate chip and chocolate ice cream with marshmallow topping, home-made hot fudge sauce and whipped cream. It used to have a chocolate cable car but now they just have a chocolate and a cherry. They also now use corn syrup in the fudge which has spoilt that a bit. Image via WikipediaI took my sundae out of the noisy crowded store and sat in the Maritime Park opposite gazing at the water and out across to Alcatraz. Its a very peaceful park. Sadly, I am assuming the sundae cancelled out my run! A short stroll to Hyde Street and the line up for the Hyde and Powell Cable Car. This is a very popular ride and if the line is too great, I walk up a couple of stops hoping to sneak on there. Today, was fine. I flashed my Muni pass so the ride was free. My favourite spot is to stand at the back of the car with the conductor. This is my favourite cable car line with a couple of amazing hill climbs. I rode to the top of Russian hill and hopped off to gaze at the view across the bay. I never get tired of it. Back for the next cable car - this time grabbing a spot standing holding the handrails at the front- and down the hill to California Street where this cable car line crosses the California Street line. I have now almost got my money's worth for my $21 three day pass with $18 worth of cable car rides! and my $2 streetcar ride). From here I walked to Grace Cathedral. I got a tourist to take a picture of me but it didn't come out! The Cathedral has an amazing rose window and an indoor and outdoor Labyrinthh that I always try to walk. Back on the cable car, down to Grant Ave for Chinatown. The sights, smells and noise of Chinatown are great fun. I grabbed a pork bun from one of the amazing noodle shops. After it, I ate the delicious apple bought at the markets earlier. I walked back from Chinatown to the Union Square shops. I popped into Neiman Marcus which is a beautiful store (I have yet to buy anything there!). I noted that my favourite Borders is gone and felt a little bereft of a rainy day browsing spot. I was looking for jeans but don't find any at Ross or Old Navy that I like. The shopkeepers told me the stores are full of Australians spending their Aussie dollars that are now worth so much more! I cross Market Street into the SOMA (South of Market). This used to be dodgy but has been revitalized extensively. One of my favourite stores, the Container Store is here and I looked at Kitchen storage items which I cannot carry with me this trip! A short walk away is SFMOMA, San Francisco Museum of Modern Art. Great building with very enjoyable exhibits. Right now there is one on about Dieter Rams, the top designer from Braun. Its amazing how art like many of their appliances are and an exhibition full doesn't seem out of place. He developed ten principles for good design which are used by other companies including Apple. The Contemporary Jewish Musuem is near by. They also have great exhibits but I don't get to visit them today. From there I caught BART to the Mission District where the City's Central American population are centred. I was in search of Pupusas, my favourite El Salvadorian food. Its a tortilla stuffed with beans or meats or cheese. The restaurant that I have been to before for my fix was completely empty. That made me worry: has this restaurant "lost it"? When my corn chips arrive, they are burnt. Now I was concerned. However, the pupusas I eat are perfect. The accompanying salad is fresh and delicious. 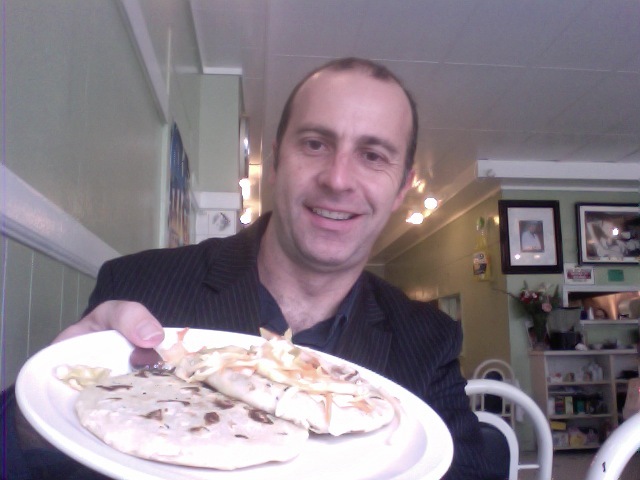 The store has none of my favourite Salvadorian drink: Kolashampan but I am still happy! There are two ice cream shops nearby but I was good. (I will go back tomorrow for some from the Ice Creamery but give Mitchells a miss!). From there I walked to Mission Dolores Park where there were hundreds of people gathered for an outdoor showing of Top Gun. Amazing atmosphere. After that, it was off to meet some friends for a drink. A perfect day in an awesome city! Air New Zealand took its stake in Virgin Blue (owners of V Australia and Virgin Australia) to 19.9% as a result of a fairly low share prices. The last time they took an interest in an Australian airline, it almost bankrupted Air New Zealand and the end result was that Australia's longest running domestic carrier Ansett ceased to exist. Image via WikipediaTen years later, Air New Zealand are hopefully wiser and Virgin are a better business. Former chief executive Rod Eddington "described Ansett publicly and internally as a great airline, but a poor business". It makes huge sense for Air NZ to have a strong relationship with an Australian carrier. The tie ups with V mean passengers can flow into and out of the Australian and New Zealand markets and Air NZ international routes. It also makes sense for Virgin to join Air NZ in the Star Alliance network just as Ansett was a member. They are clearly out to compete heavily with Qantas domestically. The question is long term whats the plan for V Australia, their international arm?. They will come in under the Virgin Australia banner in 2012 but what are their plans beyond that. Flights to Phuket and South Africa are halted. Fiji is off the cards and China seems on hold. Qantas is ramping up Asian expansion. Will Virgin focus on middle east or do the same as Qantas? In the meantime, an ex Virgin executive has gone to Tiger. As always, the Australasian airline scene remains interesting. After 43 years of flying I flew on my 777th flight. In a previous Blog post, I was trying to decide whether to fly my 777th on an Air New Zealand or V Australia 777. I appreciated the advice from friends to try Air NZ's new 777-300 and was glad I did. 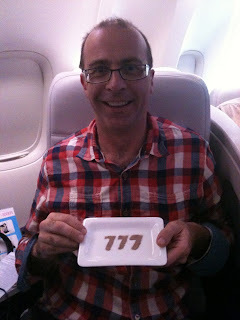 I have recently blogged about V's superb business class product on the 777-300. This Air NZ flight gave me lots of opportunity for comparison. For those who haven't been following: I flew #737 on a Southwest B737, #747 on a Qantas 747, #757 with United and #767 with Qantas. For some the number 777 represents perfection and my 777th flight was indeed close to perfect! I took 78 pictures would you believe?! Air NZ have a dedicated Check in for Business and Gold passengers at Auckland Airport. The beauty of this is that a lift (elevator) leads straight from the check in straight into customs, immigration and security. The time saved walking around the long way is brilliant. Worth staying gold for just for this feature! I checked in early, was the only one using the check in area and was through the whole process in just under 10 minutes! V Australia use Air NZ's lounge so any comparison isn't warranted. The NZ lounges continue to be superb. I enjoyed wifi, meal, snacks and a shower. I ate carefully because I wanted to save room for the on board meal! While waiting in the lounge, I met the on board Concierge, Belinda (pictured next to me). I have not seen this innovation on any other airline and its beyond impressive. My previous experience suggest that the team that Air NZ have chosen for this role are all very good and Belinda was no exception. Concierges answer questions, problem solve, help develop itineraries and make life aboard more pleasant for travellers. Belinda was saying she gets a huge variety of questions – from “can I store luggage at LAX” to “where do I connect?" to "what restaurants are good in San Francisco". I introduced myself to Belinda as the plane geek flying for the 777th time on a 777. She acknowledged me telling me that she had been sent a message from reservations to that effect. After leaving the lounge, we had another passport and boarding pass check. Some passengers were randomly searched. How someone can have got through check in and immigration with a wrong or false passport I don't know. It seems like overkill. Do they really think they will catch them at this point? There was almost no line up for the priority boarding line and I zapped through it being wished a good flight by ground staff. Belinda was on hand in the lounge area and welcomed me by name which was a nice touch. There was a small line to get on the actual 777 but it was moving quickly. There was a sign in the passageway reminding passengers to have their boarding pass ready to show in the aircraft. I have not seen that before but it is helpful especially for people who are not expecting this. I have noted there are some countries where the staff don't look at the boarding pass as you enter the aircraft. On board, I was invited to go left into the front business class cabin. The Air NZ 777-300 has three cabins as does V Australia. V dedicates more of their plane to Economy. You will see from the diagram that Air NZ have opted for the herringbone design resulting in four seats across the Business cabin as opposed to V Australia's more traditional layout with seven across. The front cabin was about half full on this flight. There were plenty of staff bustling around. Within seconds of putting my bags in the roomy overhead locker, a flight attendant appeared to take my jacket for hanging. Seconds later, another approached bearing drinks. I asked for champagne. She smiled and said: "I can give you sparkling wine on the ground and champagne in the air. Well at least until we beat the French in the Rugby" (which they did indeed do, a few days later 37-17). I said “oops. Forgot about the French". I sipped my drink and enjoyed my cashews as I inspected my seat. The seat is leather 22" wide. It has a separate ottoman footrest which you can store stuff on, invite visitors to sit on when chatting to you or put your feet on. The seat has a 12" TV screen which could be moved into multiple angles, life jacket, a very small pocket (I felt Qantas and V Australia have a little more stowage room around the seat and I like the way QF has a slot available for a bottle of water. The Air NZ bottle didn't seem to quite fit anywhere. Next inspection was the all important amenities kit. Coming in a big box the kit consisted of a very colourful pair o f socks, and La Prairie brand moisturiser etc. Air NZ didn't provide a toiletries kit. I would love an airline to give me a quality clear sturdy plastic kit I can take through security anywhere in the world. 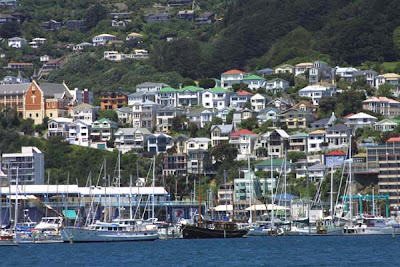 Auckland Newspapers and international magazines were distributed. There was some disquiet from some passengers that there were no Wellington or international newspapers. The safety briefing was the humorous Air NZ rugby one. I always feel that Air NZ take safety seriously without officiousness and try to engage their passengers in the safety process. I did wonder what non-Kiwis would make of some of the "in-jokes" in the video briefing. 2130 (930pm) Takeoff out of Auckland was pretty with the city lights spread out below. There were a few minor bumps out of Auckland but nothing dramatic. The seat-belt sign soon went off but came back on very quickly, however as we hit some turbulence. This seemed to be the pattern for the first half of the flight. The sensation of sitting at an angle to the direction of takeoff and landing is one I have not got used to. It does feel quite odd. Sorry folks, I am not sitting up front to have an express soup and sandwich and I went for the works and must admit I was probably a little piggy. Entree (starter for the Americans) was a cold mixed seafood dish with a choice of breads. Superb. I combined it with a Bird Sauvignon Blanc from Marlborough. I chose a streak for the main course. This was accompanied by a Syrah wine which was a little drier than I wanted. For dessert, I chose an ice cream sundae which was delicious if not unusual. 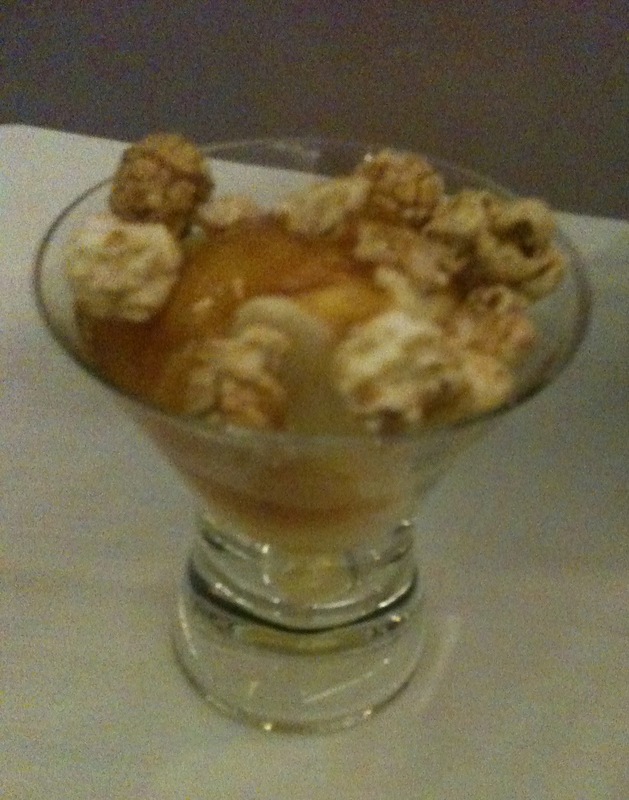 Vanilla ice-cream with popcorn and a yummy sauce. This was followed by a cheese platter. I accompanied these dishes with a lovely dessert wine which I forgot to note down. 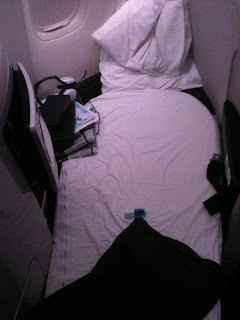 The team turned my seat into my bed with a nice thick mattress, duvet and two pillows- duck feather and hypo allergenic. 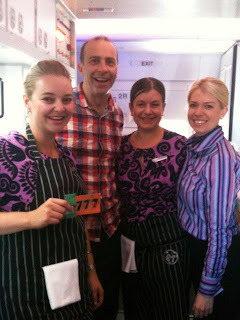 Air NZ do not appear to provide pyjamas. 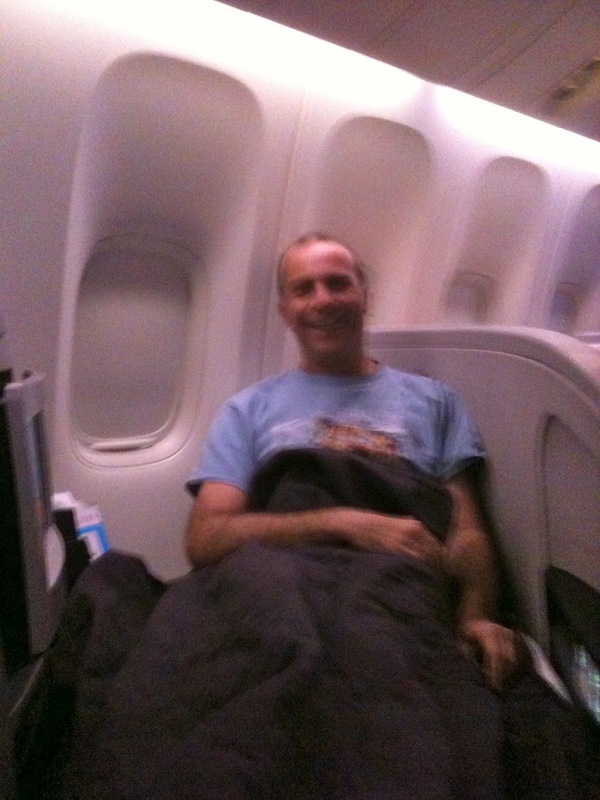 Qantas and V do so I wore my Qantas Pjs on this Air NZ flight! Sleep came quickly and I reckon I got about seven hours. The bed is a little more comfortable than Qantas business class bed and about the same as V Australia's bed. Air NZ mattress is probably a little more comfortable than V Australia;s but I did feel a little strange sleeping at an angle. I must have overcome that because I slept for almost seven hours-soundly. 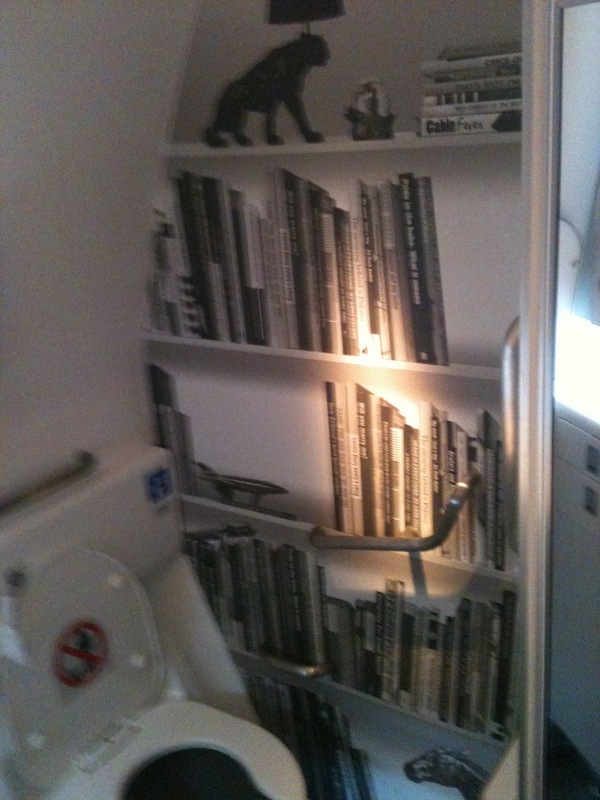 I must tell you about the lavatories on board (I ended up inspecting almost all of them!). Two of the three business class ones have real windows in them so you can look out at the clouds while using the facilities. 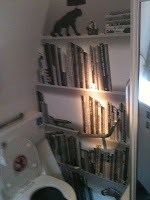 The lavatory for disabled people has a mural of a bookcase in it. I was more restrained with Breakfast having fruit, muesli and yogurt and a croissant This is where the 777 fun really started. The crew really went out of their way to celebrate the fact it was my 777th flight. Using ingredients on board they had made Little decorative plaques celebrating with me. Thank you. We were right on time into a smoggy lax. We left at 930pm NZ time and landed into lax at 240pm the same day because of crossing the dateline. It was hard to fault this flight. It confirmed to me that on this sector that V Australia and Air NZ now lead business class with Qantas following. Way at the bottom on this sector is the woeful United offering. I haven't tried Delta's Business Class on this sector yet. That's for 2012! Thank you to the Captain and the whole crew of NZ2 for a superb flight. Next big flights? I was hoping for 787 for my 787th but that's not going to happen because the plane will start flying the week after that milestone. Instead I have A380 flights with three of the carriers I have not sampled the A380 with yet: Korean, Lufthansa and Air France. I have flown Air New Zealand 39 times travelling 2 times around the world. I have only flown the 777 17 times including this flight. Apparently you can see the handover of the 787 from Boeing to ANA (at last) at 0900h US Pacific time Monday 26th- midday US Eastern time, 2am Sydney on the 27th and oddly 1am Tokyo on the 27th. I would have thought an afternoon time in Seattle would have been better. It would allowed people to watch it live at a civilised hour in the Airline's home country. eg 8am Tokyo time which equals 4pm Seattle time. Tell me whats missing-what do you like reading about in my posts? Thank you for joining me in my travel adventures. 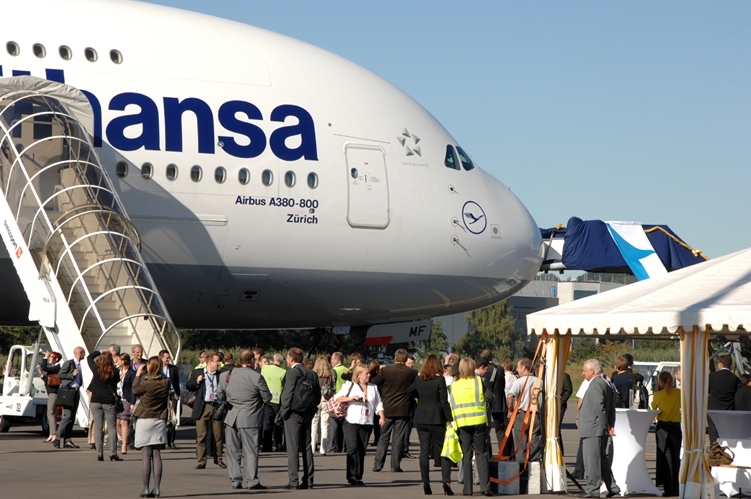 On Tuesday13th September, Lufthansa named A380 D-AIMF "Zurich", after the Swiss city which is hub for the Lufthansa owned SWISS airline. This particular A380 was the sixth in the Lufthansa fleet and has been flying for them since April this year. Picture from The Age is a digitally altered plane. The fairfax Press (Sydney Morning Herald and The Age newspapers) are suggesting RedQ or RedQ Executive Express is emerging as the most likely name for Qantas Asia ahead of RedSky and OneAsia. The new 49% venture will be 49% owned by Qantas and is one part of Qantas restructuring. Alan Joyce CEO of Qantas said that the move would create a “newer and stronger Qantas,” by tapping into the major growth that is occurring in Asia. I hate the sound of RedQ. It doesn't sound enticing. It definitely does not sound like a Premium carrier. It sounds cheap and nasty. 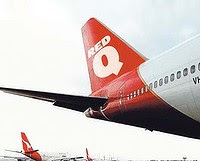 Perhaps Qantas discount subsidiary Jetstar could be renamed RedQ and the new airline named Jetstar. For Jetstar sounds classier than RedQ even with Executive Express tagged on the end. Will tourists fly an airline named Executive Express? I can't think of a better name? Perhaps Offshore Airline? or Outsourced Kangaroo? to reflect the shift of Qantas services to the new cheaper version? I can hardly contain myself as I have a secret! I have some very exciting news regarding this blog: "Wild about travel"
Theres a very strange website around which called people to "Stay away from Seattle". Apparently September 16 is "Stay Away from Seattle Day. It is meant to "give 'America's Best Place to Live' city a break from the influx of people moving to the area." 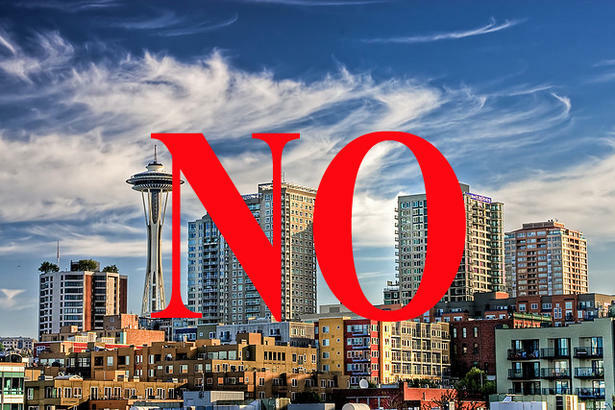 Tourists bring 5.5 billion dollars into Seattle every year but not everyone wants them it seems - at least one day a year. There have been a few places in the world that I have been to where I have wondered if people actually want tourists. I have never been made to feel really unwelcome but I have wondered. Many people say Paris is famous for not wanting tourists. My experience has been the opposite. However, I do get the sense that some Parisians get tired of sharing their marvellous city with gawking rude tourists who make no effort to really get into the la vie de Paris. Have you ever felt unwelcome in a city? In the meantime, Happy Keep Away from Seattle Day! Korean Air now has four Airbus A380s as of last Thursday. The newest A380 will undergo the usual tests and will start flying from Seoul/Incheon to Paris ( Mon, Wed, Fri) from 26 September until 29 October and to Los Angeles (every Tue, Thu, Sat) from 10 October 2011. I plan to fly the Seoul-Lax route in November. Anyone want to join me? 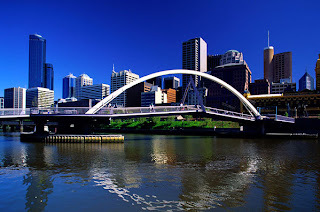 Melbourne, Australia is very excited that it scored 97.5 out of 100 in the Economist's annual most liveable cites survey knocking Vancouver out of top place. The Economist designs the rankings for employers to use when assigning hardship allowances as part of job relocation but they have developed a life of their own with the rankings capturing the attention of people in the street and politicians. The indexes also ignore other issues like the cost of living in those cities, sustainability, and equity and other factors. For example housing costs in Melbourne are now some of the highest in the world when then Australian dollar's strength is accounted for. Having said that I agree with the Economist's ranking of Melbourne. 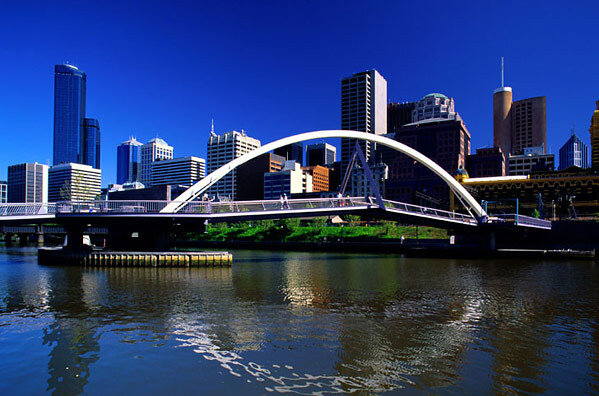 It is for me the most livable city in the world taking into account its Cultural aspects, Safety, Public Transport and aesthetically pleasing street layout, buildings, parks, river and bay. I have listed my top ten cities below. Adelaide, SA, Australia - a city where you are ten minutes from anything: shops, beaches, forests. A good arts scene with amazing food. The Economist said 9th place, I say second. Reykjavik, Iceland - an unusual contendor- cool, fun and safe! Paris, France- many Parisians would disagree but there is a lot to attract one to living in the capital of France. New Orleans, Louisana- seriously. Like nowhere else in the world, I could easily live here- tomorrow! Where would you most think would be a great city to live in?